"So... are you Jewish now?" My sisters question, though somewhat expected, made me laugh. We aren't converting. We are still Christian, still celebrating Christmas, and still going to drink lots of hot cocoa, though I'm not sure hot cocoa has a religious preference. We are just learning more about our Jewish roots. Yes, we have Jewish roots. We are followers of Jesus - a Jew. And though Jewish traditions have evolved since Jesus was alive, we still think they are worth knowing about, learning about, and even practicing. My knowledge of Hanukkah is very limited. VERY limited. What I know about Hanukkah can probably fit in a followed out dreidel. But I'm learning. Our whole family is learning. Hanukkah is a Jewish holiday that celebrates the miracle of oil in the temple lamps. The English word Hanukkah means "rededication." The temple had just been taken back from the Syrians by the Hebrew army. They had cleaned out the temple and were in the process of rededicating it, when they discovered there was only enough oil to light the temple for one night. Eight days later the lights finally flickered out. Hanukkah celebrates this miracle with the 8 days of Hanukkah. The actual celebration part seems to vary, but there are some basics. We will have a menorah that we will light each day. There are 9 candles on a menorah, 8 represent each day of the miracle, and the 9th center candle is used to light the others. 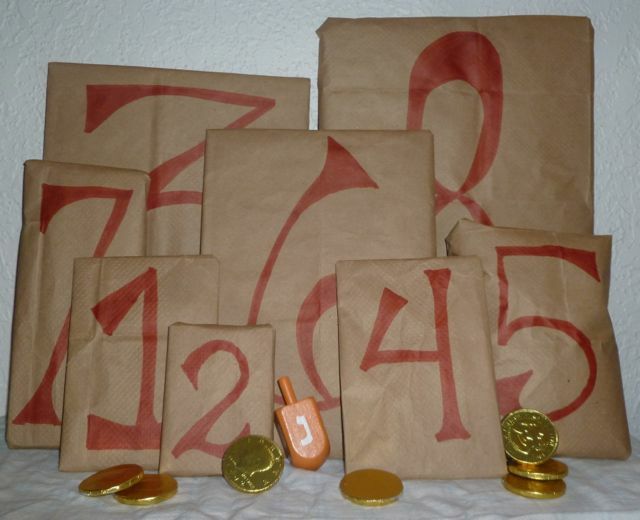 We will also play the dreidel game - each of the 4 sides of the dreidel - a square-ish wooden top - traditionally has one Hebrew letter from the Hebrew "A miracle happened here." We will also be making traditional latkes - potato pancakes - and making homemade doughnuts. We'll also be making some Hanukkah crafts throughout our 8-day celebration. I have Millie's 8 presents wrapped, but I'm finding it harder to find small, inexpensive toys for an 18-month old. I have 4 so far. Our Hanukkah presents for the kids are small and inexpensive, kind of like stocking stuffer kind of presents. Doing Hanukkah AND Christmas can be pretty daunting, so we kept it simple and inexpensive - learning toys from the Dollar Tree and the dollar bins at Target, and other little craft items, books, etc. Millie's Hanukkah presents: Nativity stickers, animal stickers, Melissa & Doug scissor set, Nativity coloring book, glitter crayons, play-dough shape cutters, and an ABC writing book. Sam's Hanukkah presents are: a small dump truck, a ball, "The Bible Says..." book, and jungle bells. I need to get 4 more little things for him (any ideas??? ).